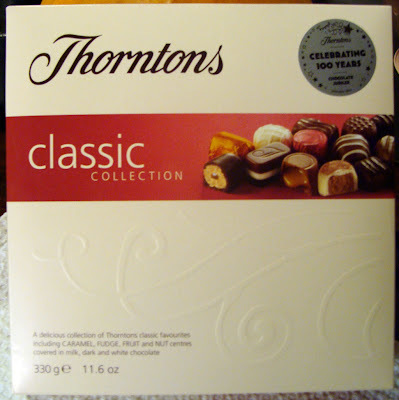 Free From G.: Thorntons Classic Collection - Gluten Free Chocolates! I made my second trip to Asda. Whilst in the Christmas food section I happened to pick up a box of Thorntons Classic Collection and looked on the back of the box. On my usual shopping trips I would never even bother looking, but because I was somewhere different I thought what the hell. Sure enough under the contains list is says: Nuts, Milk, Soya, Egg. I started to get that, I might be able to have it excitement! I glanced just a bit to the right and under the suitability it says: Vegetarians, Gluten-Free, Alcohol-Free. I think I stood there with this box of chocolates in my hands with my mouth open through shock for at least 10 seconds. It was a definite crazy coeliac moment. It's possible that I may have jumped up and down. Slightly. It's certain that I cuddled the box all the way to the checkout. No idea what the actual PPM is obviously, but I've eaten most of the different flavours and I've had absolutely no problems whatsoever and I'm very sensitive to gluten. You may have already known that Thorntons Classic Collection were gluten free, but I didn't. I actually get to eat my favourite chocolates again, now that's a thing I never thought possible. I've since come across other boxes of Thorntons that don't contain gluten, however, on the back of the packs it now says No Gluten Containing Ingredients, not gluten free. See here for Continental By Thorntons, my personal favourite. Yay this is good news, I love finding something new to eat!